Silverton is in San Juan county, which is the least populous county in Colorado with 701 people. The only insurance carrier selling plans on the individual/family market in San Juan county is Anthem BCBS. Interestingly, the only insurance company with ANY providers in the county is RMHP, who only sells policies in Mesa county. Anthem BCBS has 0 unique providers in San Juan County. Anthem BCBS has 0 unique facilities in San Juan County. Anthem BCBS has 0 total unique providers + facilities in San Juan County. Bright has 0 unique providers in San Juan County. Bright has 0 unique facilities in San Juan County. Bright has 0 total unique providers + facilities in San Juan County. Cigna has 0 unique providers in San Juan County. Cigna has 0 unique facilities in San Juan County. Cigna has 0 total unique providers + facilities in San Juan County. Colorado Choice has 0 unique providers in San Juan County. Colorado Choice has 0 unique facilities in San Juan County. Colorado Choice has 0 total unique providers + facilities in San Juan County. Denver Health has 0 unique providers in San Juan County. Denver Health has 0 unique facilities in San Juan County. 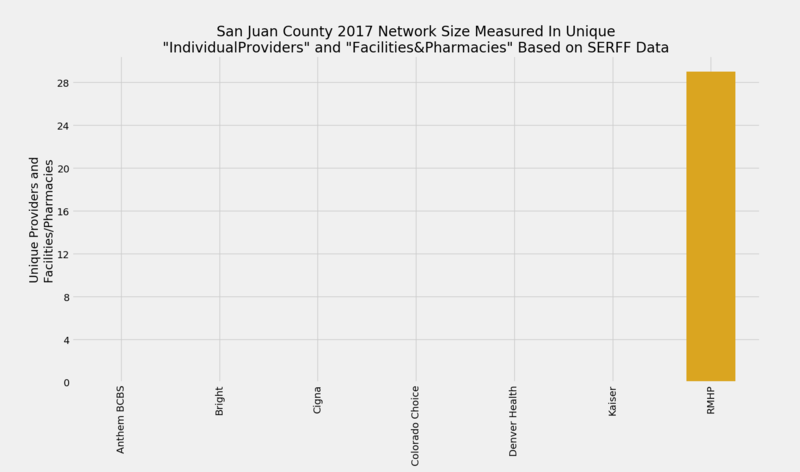 Denver Health has 0 total unique providers + facilities in San Juan County. Kaiser has 0 unique providers in San Juan County. Kaiser has 0 unique facilities in San Juan County. Kaiser has 0 total unique providers + facilities in San Juan County. RMHP has 23 unique providers in San Juan County. RMHP has 6 unique facilities in San Juan County. RMHP has 29 total unique providers + facilities in San Juan County.